Girlie Girl Originals - Texas Girls Short Sleeve Adult T-Shirts. Texas Girls logo on front left chest 3" of t-shirt. 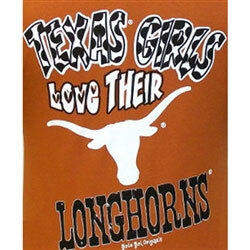 The back of the t-shirt has the following saying, "Texas Girls Love Their Longhorns".